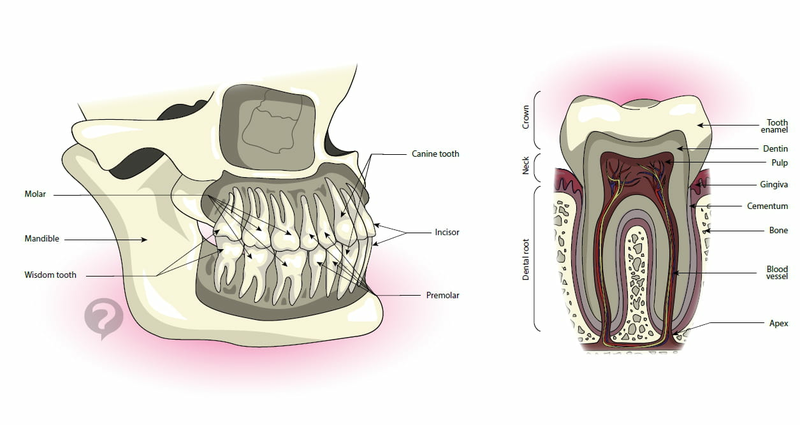 Humans have two rows of teeth, set in the jaws through their roots. This organ can feed grinding and chewing food, talking, forming sounds with the tongue and lips, and support the facial structure at the mouth. 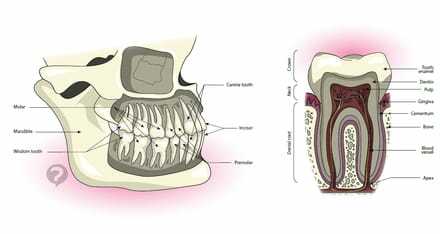 The teeth are formed by a ring, and covered with visible white enamel, planted from a root in the jaw bone, and a ligament connecting the root to the bone. In adulthood, there are 32 teeth, 8 incisors, 4 canines, 8 premolars, molars 8, and 4 wisdom teeth. Original article published by Jean-François Pillou. Translated by Marjorie Gaulier. Latest update on August 20, 2014 at 05:35 AM by christelle.b. This document, titled "Teeth - Definition," is available under the Creative Commons license. Any copy, reuse, or modification of the content should be sufficiently credited to CCM Health (health.ccm.net).